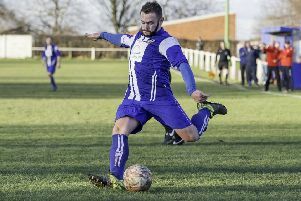 Newly promoted Pontefract Collieries have completed their management line-up for their return to the Toolstation NCE Premier Division with Russ Eagle joining the club. He will help joint managers Duncan Bray and Nick Handley in the dugout and the three will work together in a bid to ensure that Colls’ first season in the Premier for 16 years will be a successful one. Eagle brings a wealth of experience and has a proven track record in recent years. Duncan Bray said: “We had a huge amount of top quality interest in our recent advert. After the interview process it was clear that Russ was the man for us. “He brings the qualities we need at the club to help us develop and strengthen and keep us moving forwards. “We are passionate about building on our success last season and Russ will ensure we do just that. “We are well on with planning for the new season and we will be making contact with players shortly ready for registrations in early July. “We don’t believe that there is any need for large-scale squad changes as we finished the season with an outstanding group that we feel are well capable of competing in the NCE Premier Division and we definitely want to keep the vast majority of the squad. “It is probably going to be the case that one or two of the lads will choose to leave, but on the plus side I am sure there will be new additions brought in to strengthen the team to ensure we keep building and progressing. “We would like to thank those who applied for this post. The volume and standard of candidates has been excellent and all of those whom we interviewed were more than capable of doing a job for Pontefract, but we felt that Russ was right for us”. Colls have also appointed a new club physio, Ross Gemmill, while pre-season training began on Monday.